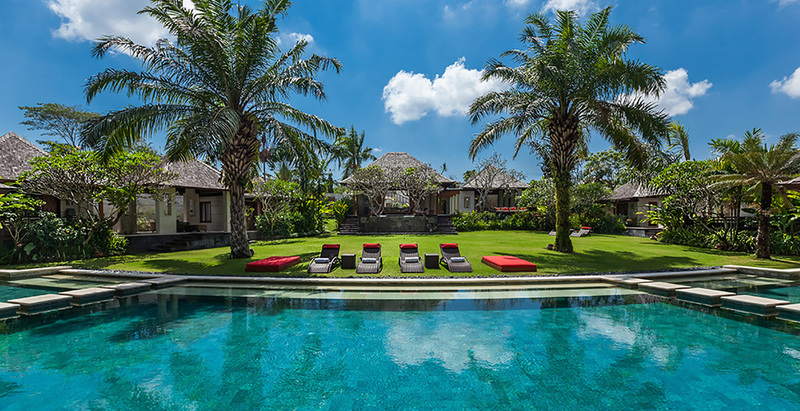 This fabulous multi-pavilion six-bedroom luxury residence in hipster hot-spot Canggu is just five minutes’ drive from the beach on Bali’s ‘sunset’ coast. The fully staffed villa estate includes a private chef and offers extensive formal and casual living spaces, two master suites, four guest suites, media room, 21-metre pool, gym, and flood-lit tennis court. Facilities include mini football pitch, basketball, badminton and a trampoline. Guests benefit from complimentary VIP passes for Finns Beach Club as well as Finns Recreation Club a five-minute walk away, with its famed water park, 25-metre lap pool, covered tennis courts, squash courts and myriad additional facilities.